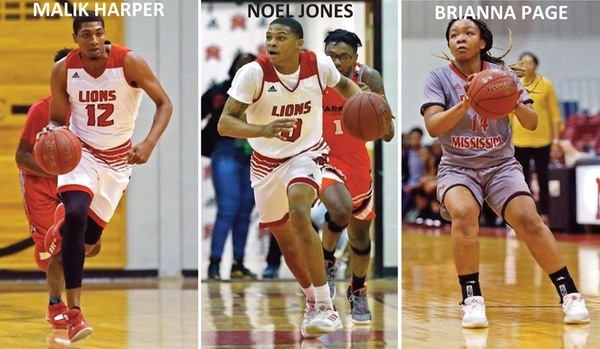 SCOOBA – East Mississippi Community College will be represented by sophomores Malik Harper and Noel Jones from the Lions' state championship men's basketball team as well as by Lady Lion sophomore Brianna Page during Friday's annual Mississippi Association of Community and Junior Colleges All-Star Basketball Games to be hosted by East Central Community College in Decatur. Friday's hoops doubleheader featuring sophomore players from the two-year colleges around the Magnolia State will be played at Brackeen-Wood Gymnasium on the ECCC campus. The women's game pitting the MACJC North Division versus the MACJC South Division will tip off at 5 p.m., followed by the interdivisional men's contest at 7 p.m. Admission is $8 for adults and $5 for students. Holmes Community College is scheduled to live stream both all-star contests at http://www.holmesccmedia.com. Harper, out of Fort Lauderdale, Fla., averaged 6.3 points and 5.0 rebounds per game this past season for head coach Billy Begley's 19-8 EMCC Lions. The 6-foot-8, 210-pound forward also totaled 28 assists, 15 blocks and 15 steals as a 16-game starter this past season. Harper's top game was a 21-point, 12-rebound effort against Mid-South Prep Academy. Jones, a Pascagoula product, averaged 2.9 points an outing this past year as an EMCC sophomore. The 6-foot-1 sophomore backcourt performer ranked fourth on the team shooting 30 percent from three-point range with 18 made 3-pointers. On the women's side, Page totaled 331 points (7.4 ppg), 211 rebounds (4.7 rpg), 42 assists, 40 steals and 11 blocked shots while starting all 45 games of her two-year EMCC playing career for head coach Sharon Thompson's Lady Lions. As a sophomore, Page was the team's No. 4 scorer (8.0 ppg) and third-leading rebounder (4.9 rpg) along with being credited with 28 assists and 26 steals on the year. With a career-high 25 points against Holmes this past season, Page recorded consecutive double-doubles versus Coahoma (11 pts & 10 rebs) and Northwest Mississippi (20/13) in February. She previously averaged 6.7 points and 4.5 rebounds per contest as an EMCC freshman coming out of West Jones High School in Laurel.